I think most of us know about the sad period in American history of Japanese internment camps when, following Japan’s bombing of Pearl Harbor, the United States “interned” men, women, and children of Japanese descent (often including whole families, some of whom were born in America or were naturalized American citizens). I’ve always thought of these camps as being in the western part of the country. I had no idea until just a couple of days ago that there were three “enemy alien” internment camps in Texas — and one of them was in Dallas County. In December, 1941, authorities in every city in the country were swooping down on foreign nationals (or sometimes just people who looked foreign or spoke with an accent), hauling them in for questioning, often arresting them for nothing more than the fact that they had been born in another country. Dallas was certainly no exception. Unsurprisingly, immediately following the bombing of Pearl Harbor, Dallas’ few Japanese residents were rounded up. All ten of them. The photo at the top shows five of the first detainees, at the Dallas jail. 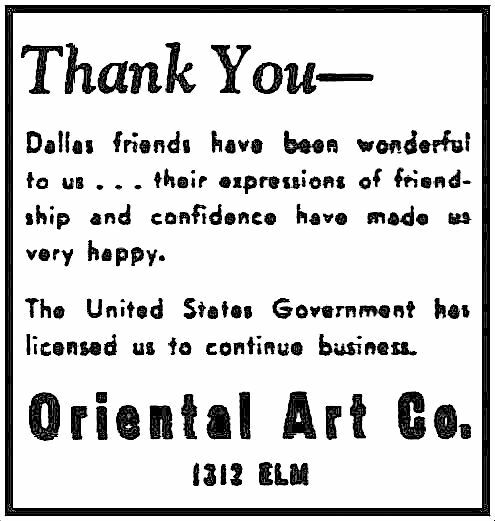 Most of Dallas’ Japanese residents worked for the Japan Cotton Company, an important cotton broker which had occupied space in the Dallas Cotton Exchange building since the late 1920s. (For a bit of weird trivia, the father of famed gossip columnist Liz Smith was working as a cotton buyer for the company during the war, commuting to work from Fort Worth.) If they weren’t working for the Japan Cotton Company, they were probably members of two Japanese families with long ties to Dallas: the Muta and Sekiya families, owners of the respected Oriental Art Company since at least 1903. 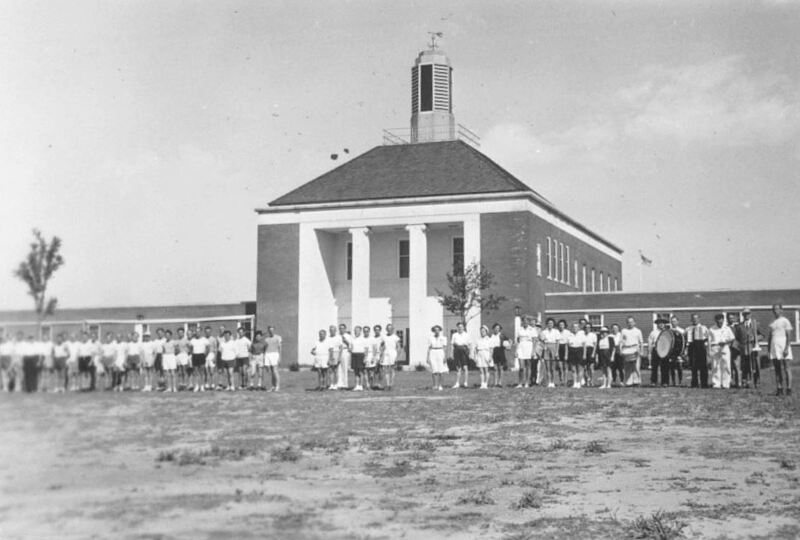 The first internees arrived in the Dallas area in April, 1942. The group was comprised of 250 women and children (“citizens of the Axis nations”) who had been arrested in Panama. They were interned in Seagoville, displacing the federal women prisoners who had previously been held there — they were transferred to a prison in West Virginia. 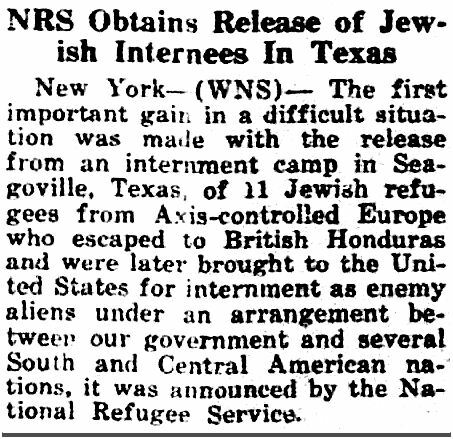 Jewish refugees sometimes found themselves tossed into enemy alien internment camps — simply because they had fled homelands which happened to be “Axis-controlled” countries with which the U.S. was at war (even though is seems highly unlikely that a German Jew would be an ardent Nazi sympathizer, gathering classified information to send the Führer’s way). Yes, Seagoville had detainees from all over the place. It was quite the melting pot. There was even a Bavarian princess in there. I wonder if a single person in that camp, held against his or her will for months and years, posed any actual threat to Allied forces. Germans and Italians were able to “blend in” to American society, but Asian men and women had a harder time and were more often harassed. 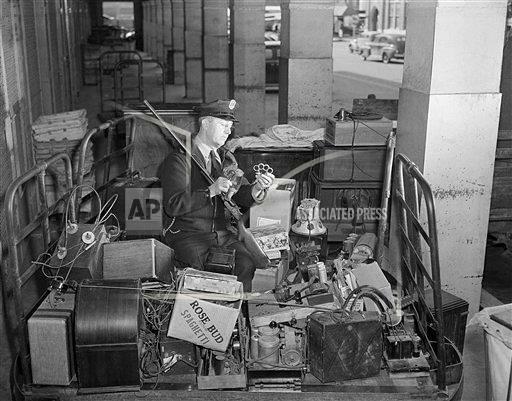 The person who seems to have most disliked and distrusted Japanese people was top Dallas police detective Will Fritz — in fact, The Dallas Morning News called Fritz “one of Dallas’ most enthusiastic Jap-haters” (DMN, Feb. 17, 1943). Let’s just say that Capt. Fritz wasn’t going to be sending the wartime Welcome Wagon to any prospective Dallas residents of Japanese descent. One Dallasite who was pretty angry and unhappy with the situation was Masao Yamamoto, an executive with the Japan Cotton Company who had lived in Dallas since 1928. 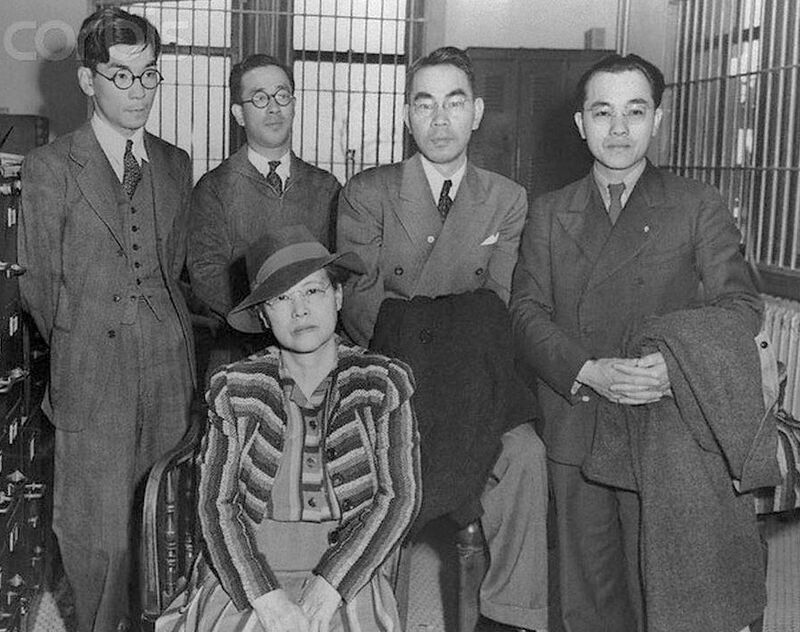 He and his wife and two young sons (one of whom was born in Dallas) were living what appears to have been a nice life in the M-Streets when they were “detained.” Ultimately, the Yamamoto family was deported and sent to Tokyo, six months after the photo at the top of this post was taken (Mr. Yamamoto is the third from the left in the top photo) — they were part of a sort of prisoner swap. Mr. Muta was spared the “enemy alien” internment camp, but, along with other Asian men and women residing in the United States, he was barred from becoming a naturalized U.S. citizen because of the “Oriental Exclusion Act.” The inability of Mr. Muta to become a U.S. citizen did not dampen his enthusiasm for American democracy: he paid his poll tax every year, even though he was not allowed to vote, and he was a proud member of the Dallas Chamber of Commerce for over 25 years. 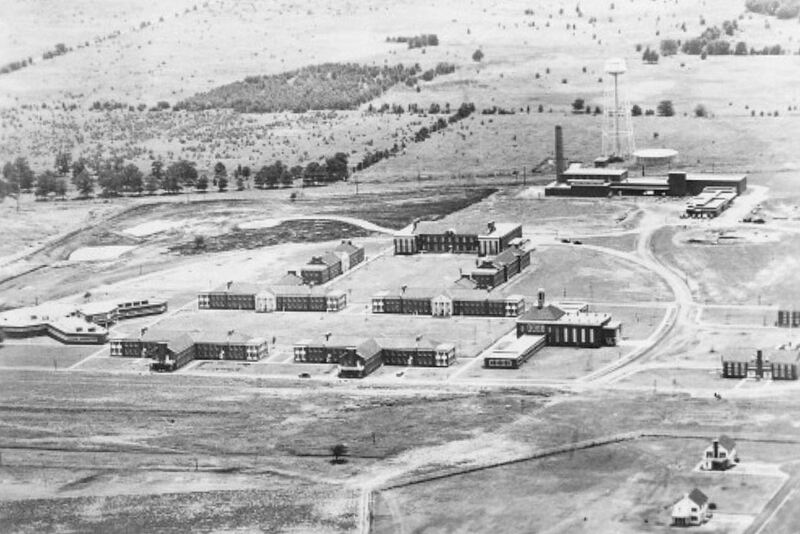 The Seagoville Enemy Alien Detention Station was closed in May, 1945, and the site was returned to the Bureau of Prisons. Photos of the Seagoville camp are from the Institute of Texan Cultures (UTSA). One of the best articles I’ve read on the camp was an interview with two men (Erich Schneider and Alfred Plaschke) who, as American-born children of German parents, were interned at Seagoville and were later deported to Nazi Germany (in a prisoner exchange) where they experienced the terrifying bombing of Dresden. Both families returned to the United States after the war. The article by Mark Smith — “German-Americans Recall Horror of Deportation — Hundreds of Detainees Sent to Nazi Germany in POW Trade” — appeared in the Houston Chronicle on Nov. 11, 1990, and can be read here. Thanks to friend Julia Barton for posting about (and suddenly making me aware of) the Seagoville camp.